This mod enables the “Mount” interaction on horses for children and pregnant sims. 30 June 2012 – Updated to allow children to enter equestrian competitions and to use “Buy Horse” at the Equestrian Center. 28 May 2012 – Updated to add more unlocked interactions for children. Please re-download if you use a child version. Pregnant sims did not need more interactions to be unlocked. 22 April 2012 – New Flavor Added! Children can mount horse. 27 March 2012 – New Flavor Added! Children and Pregnant Sims can mount horse. This mod was built with patch 1.29. Due to its simplicity, this mod may not necessarily require an update after major patches. It’s always best to check in, though. New: New flavor added which allows children (in addition to pregnant sims) to mount a horse. Please note: When children mount a horse, they will stretch, but will return to normal child size once they dismount. Pregnant Sim can Mount Horse mod will conflict with any other mod that alters the Mount_Sim ITUN resource in the GameplayData.package. Child can Mount Horse and Child and Child and Pregnant Sim can Mount Horsewill both conflict with any other mod that alters the following ITUN resources in the GameplayData.package. 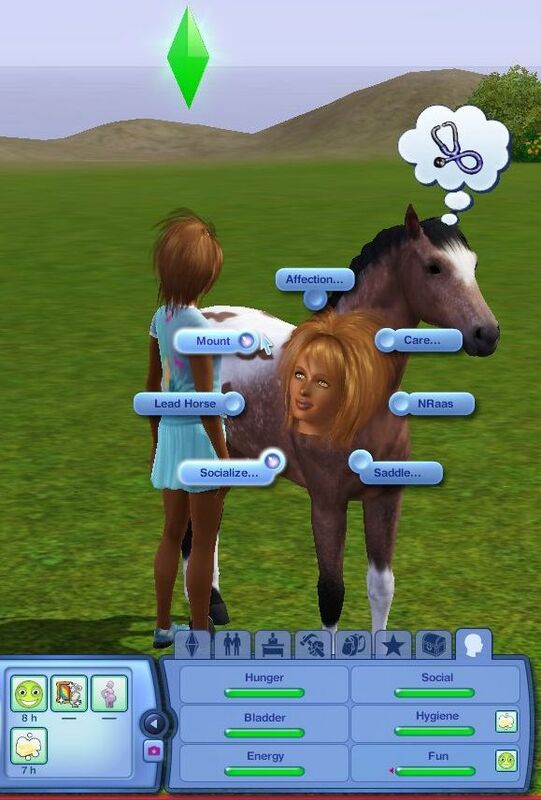 This mod will conflict with shad0w’s Child Can Ride Horse mod, available at Custom Sims 3. Please comment here or PM me at MTS if you have any problems with this mod. Peter & Inge Jones for S3PE, Armiel for the Builder’s DIY Island which I use so frequently for testing. The lovely horse you see picture above was created by Miss Al at MTS. The hair on my sim is Peggy 445, converted by Savio and retextured by Shyne. Thank you! I’m Bluna The Sims,and I’m very grateful! =D Not wanting to be boring..but can you make a mod to children mount horses too? I love horses from TS3 Pets! Hi, Bluna The Sims. Thank you for your comment. I have updated the post to include a new flavor which also allows children to mount horse. Both children and pregnant sims will be able to use the interaction. Pleae let me know if you have any problems. The children not can ride the horse,they only can mount.But,walk,not.It’s updated to 1.33? Hi, Bluna. Thank you very much for the report. I greatly appreciate it. The mod is perfectly compatible for 1.33. However, I forgot to unlock the other interactions for children (pregnant sims did not require this). I’ve fixed it. Please re-read the post so you know which interactions have been unlocked and then re-download the mod. I can’t get my child sims to mount… How do I install this? Maybe I’m not putting it into the right folder. Hi, I answered your post at Simlogical. Does anyone know if this conflicts with the horse height slider mod? I mean I’m downloading it anyway, so I guess I’ll find out, but I’d kinda like to know. It will not conflict with a horse slider mod, but I have no idea how it will look either. Can the children gain the horse riding skill? Is this compatable with Sims 3 pets? and you are always coming out with some amazing things. Sorry to bother, but where is the download button?